My Bright Firefly: Easy Christmas Pop-up Card. Painting with Yarn. This Christmas card craft came out adorable and was easy enough for my preschooler to make with minimal assistance. Painting straw using yellow tempera paint and yarn was awesome fun, but My Firefly was even more happy to make this special baby for her Christmas card. Pictured above, we played with the light-up baby in the straw: built a shed for him and discussed the Christmas story while at it. The discussion led to many questions. Why was this very special baby in the straw? How did the three wise men find the baby? etc. The whole family got involved into this discussion to add their favorite details. This wonderful discussion became an inspiration for My Firefly's Christmas card. We chose purple construction paper for the dark Christmas night. My Firefly used yellow tempera paint and a piece of yarn to paint straw for the baby. She dipped her yarn into the paint, then positioned it onto the paper and lifted it right up to make random lines of straw in all directions. This is her second painting using yarn. 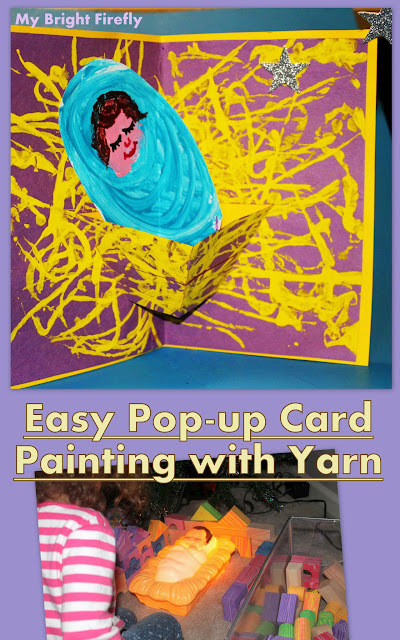 This painting technique is fun sensory play! You can find our previous painting with yarn here: Go Away, Big Green Monster! My Firefly loved painting the baby! We used white construction paper for this part. With blue tempera paint, she painted a smaller circle for the face and a bigger oval for the blanket, painted the blanket blue leaving inside the circle blank. When the blue paint was still wet, I offered her to draw lines on it in a circular motion using a clean brush - to resemble the folds of fabric. She painted the baby's face pink. We left both paintings to dry. While the paint was drying, we decorated the front cover of the Christmas card. The three wise men are walking towards the star. We used the sturdier yellow cardstock paper folded in two. The word "believe" is stamped with white glue using letter stamps and sprinkled over with purple glitter. The picture is a cut out (source unknown) positioned diagonally towards the sticker star. The star is fixed to the inside corner of the paper so that one can follow the star, open the Christmas card - and find the baby. To make the manger pop-up, purple paper was folded in two. Three cuts are made starting in the middle, each next one is under the previous and shorter. About half an inch is cut off the 3 sides of the folded paper to make it smaller than the yellow card and leave yellow margins around the purple paper. Open the purple paper and form the pop-up manger by making the folds on both sides of the manger with the center folded in the opposite direction. Add details to the baby's face. Pictured below, cut the baby out and insert him into the manger by about an inch or two. We made a dot of glue on the underside of about baby's face. The rest of the cut out is not glued to make a 3-D effect of the baby surrounded by straw. 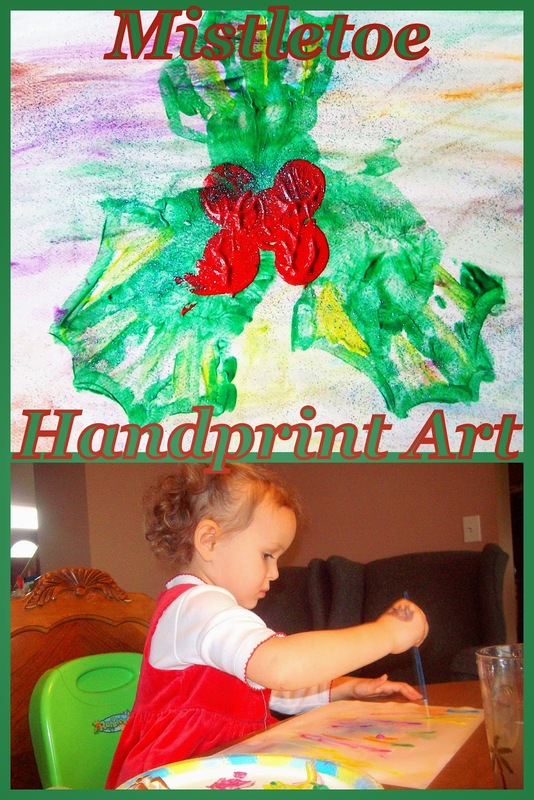 Develop Fine Motor Skills with a Homemade Christmas Card from Sugar Aunts. Hole punch is one of kids' favorite tool. It is great for preparing hand muscles for writing! Such a neat Christmas card here! Washi Tape Christmas Cards from Mama Smiles. These lovely kid made stickers are simple and adorable! Christmas Cards for Kids: Washi Tape Baubles from Crafty Kids at Home. Brightly colored baubles make for cheerful Christmas Cards! Penguin Christmas Card from Adventures of Adam. Love this mess free painting technique using some cling film. Such an adorable Christmas card! Merry & Bright Christmas Cards from Books and Giggles. 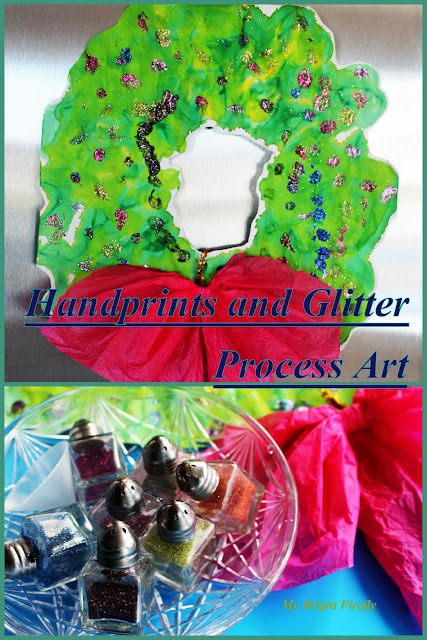 Printing with aluminum foil allows for creative and mess free painting. 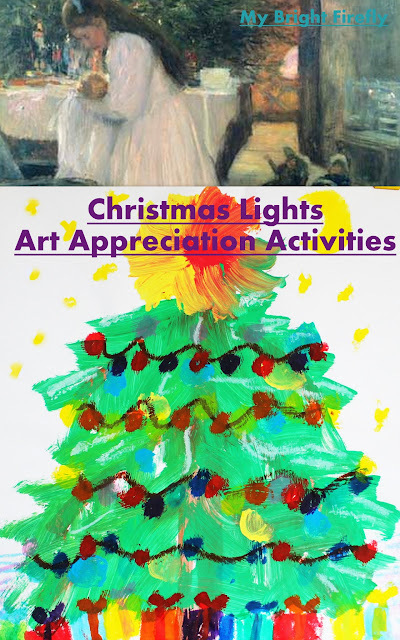 Plus making Christmas cards is an inspiration for fun literacy activities! Gingerbread Man with a Candy Cane from The Gingerbread House. A candy cane addition is a wonderful idea for the fun Christmas cards to friends! Marbled Homemade Christmas Card from Fun-A-Day. These beautiful Christmas cards are painted using shaving cream: so fun! Buttons & Corrugated Board Christmas Cards from Teach Me Mommy. Free Nativity Themed Thank You Cards from 3 Dinosaurs. A Simple Holly Christmas Card from Pickle Pie.